What is a nasal “nebulizer”? Nebulization is a term that is usually applied to administering medications to the lungs in a fine mist. It refers to converting any solution into a spray, or to any treatment that uses a spray. This drug delivery technique has been found in various forms for centuries and is still widely used today. However the same delivery technique is sometimes called “atomization.” The terminology can sometimes be confusing for patients who are not sure how their medication is supposed to work. What is Topical Sinus Therapy? The term nebulization is sometimes used to refer to topical delivery of medication to the nasal passages and sinuses. When we talk about topical sinus therapy, however, we do not want to confuse delivery of medications to the lungs with delivery of medications to the sinuses. Topical sinus therapy involves delivery of a medication to the sinuses through the nasal passages, but it is not meant to reach the lungs. Most often topical sinus therapy is prescribed to treat rhinosinusitis. Nebulizers most often use a mouthpiece that sends aerosolized particles of a medication into the lungs. They are frequently prescribed for conditions like asthma and COPD. Sometimes a nebulizer is used instead of metered dose inhaler for these conditions, especially for patients who can not hold their breath long enough to use an inhaler. Nebulized medications may include albuterol or budesonide. Some health professionals will refer to the administration of a solution to the nasal passages with a powered device as “sinus nebulization,” which is technically accurate. However, we prefer to use the term “atomization” to differentiate the target of an automated nasal spray device. The term “nebulizer” leads many to believe that the medication reaches the lungs or is made to target the lungs. In the case of the Rhino Clear Sprint atomizer, the medication targets only the nasal passages and sinuses. When drugs are delivered intranasally and are meant to have local effects on the sinuses and nasal passages, they sometimes include a mucoadhesive ingredient. This helps the medication stay in the sinuses so it can have a longer duration of effect. Most treatments that are made by a compounding pharmacy to be applied nasally are meant to have a local effect on the sinuses and not produce systemic effects. A nasal atomizer can be used to either deliver drugs locally or to produce a systemic effect. When a systemic effect for a drug is intended, an oral administration route is most often used. However in some situations a nasally administered drug may be used as an alternative. This may be beneficial in situations where a drug has low bioavailability when given orally, or when a patient is not able to take a medication in a pill form. Certain supplements like the antioxidant glutathione have been shown to cross the blood-brain barrier when administered in a nasal spray. This type of treatment would not fall under the category of “topical sinus therapy” as the target is not the sinuses and nasal passages. To summarize, both sinus nebulization and atomization refer to the conversion of a liquid solution into a spray. Whether this spray is intended to be delivered to the nasal passages and sinuses or the lungs depends on the medication and treatment. 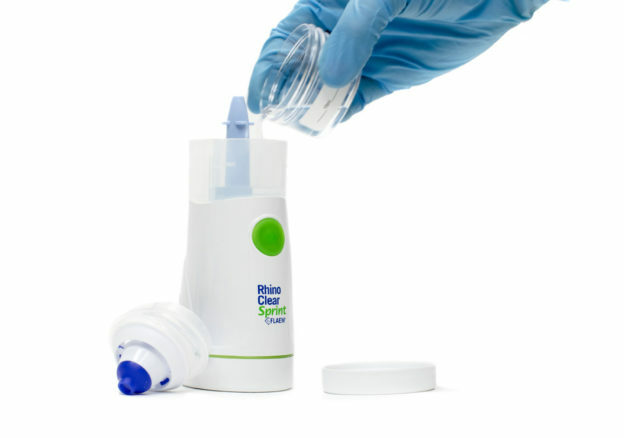 The Rhino Clear Sprint is an atomizer that is used for nasal washing or for delivery of medication to sinuses. It is not meant for delivery of medication to the lungs. However some clinicians may call this “sinus nebulization.” It is the same administration method, just different terminology. This entry was posted in ENT and tagged atomization, nebulizer, sinus nebulization, topical sinus therapy on July 24, 2018 by whmedsupply.